Today I'm back with more nail art in the form of a mani swap. This time with the lovely Elaine aka elaine.nails on Instagram. She decided to recreate my spring floral nails (HERE) and I decided to recreate her mermaid nails. I was honored that Elaine agreed to do this mani swap with me as her work is stunning! I'm always in awe of her gradients and water marbling.... just everything really! Her recreation was amazing! You should definitely check her out if you don't already follow her. You'll find her blog HERE. So I can't remember the last time I even did a gradient let alone a glitter gradient so this was pretty new for me AND it was my first time using these mermaid vinyls. It isn't my best work but overall I was pretty happy; more practice needed I think! Essie Fiji £7.99 Boots or Superdrug. Models Own Northern Lights (pink) £4.99 from Models Own. Models Own Southern Lights (lilac) £4.99 from Models Own. 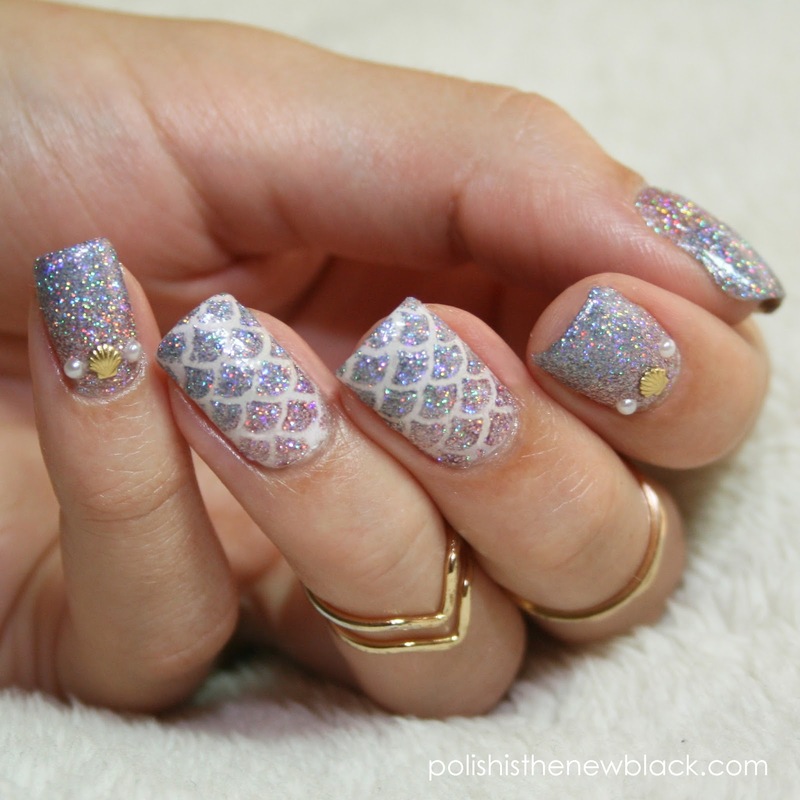 Mermaid Stencils £3.22 from Twinkled T.
Gold Shell Studs £1.50 from She Sells Sea Shells. Pearl Rhinestones £2.70 from Born Pretty Store. Makeup sponges £1 from Pound World. BAM glitter base coat £3 for 5ml or £6 for 10ml from Rainbow Connection. So to create this look I started with a base of Fiji on my middle and index finger and a base of Northern Lights on my thumb, pointer and pinkie. I applied a quick dry top coat over Fiji to make sure my polish was completely dry before applying my vinyls. I dampened my sponge in water and squeezed out the excess before applying layers of northern lights and southern lights to my sponge. I rolled the sponge onto my nail and moved up and down slightly to blend the colours together. The vinyls were removed immediately. I topped all my nails with quick dry top coat and applied the shells and pearls. Although they aren't perfect I really really liked them. The glitter base coat worked perfectly under this; it literally peeled off in one go! Maybe it worked a little too well as it only lasted approx a day. It makes glitter removal so simple and is perfect if you just need to wear glitter for a short while but don't want the hassle of trying to remove glitter with nail polish remover. 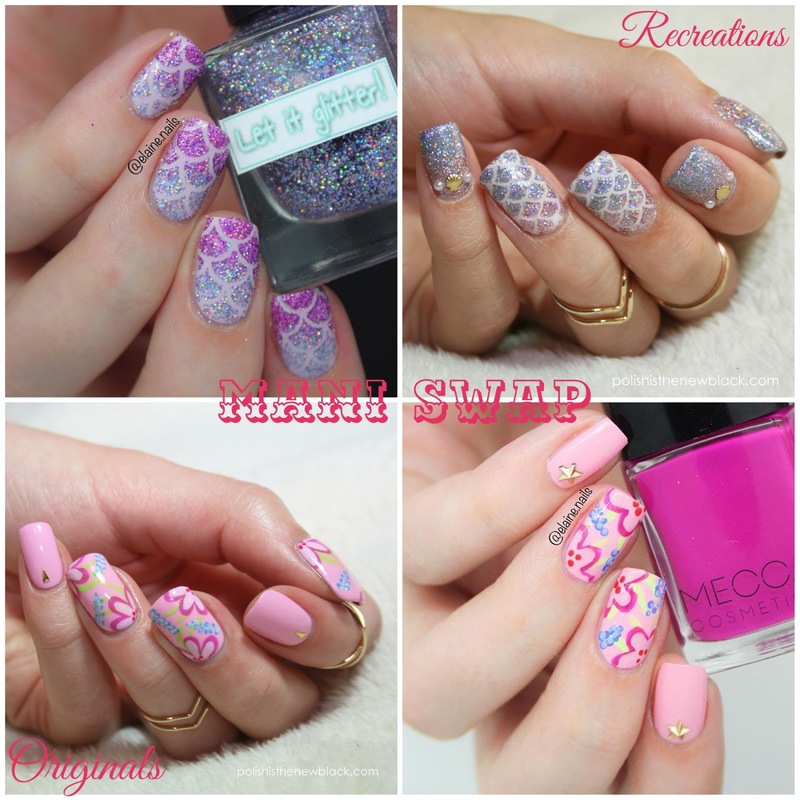 Such gorgeous designs, I love the mermaid one, truly stunning!